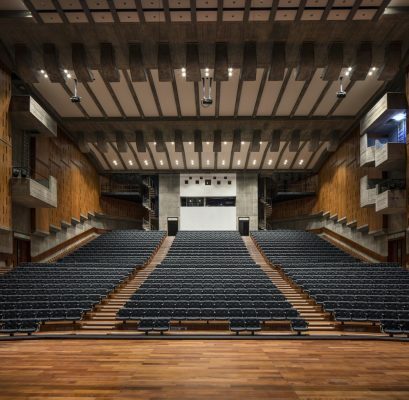 On Monday April 9th Southbank’s Queen Elizabeth Hall, along with Purcell Room, will open its doors to the public for the first time since closing for refurbishment at the end of 2015. For those still hoping to stay in this remarkable installation, there’s a chance to try again on 19th January 2012, when bookings open for nights between July and December 2012. A Room for London is a one-bedroom installation that will sit on top of the Queen Elizabeth Hall at Southbank Centre. The room was commissioned by Living Architecture and Artangel, in association with Southbank Centre, the London 2012 Festival and Arts Council England, and designed by David Kohn Architects and Fiona Banner. It is available to stay in (for one night per booking only) throughout 2012. Visit www.aroomforlondon.co.uk for general information on A Room for London. Kohn and Banner’s winning design is for a boat which, perched on the Queen Elizabeth Hall roof, will appear to have come to rest there, grounded, perhaps, from the retreating waters of the Thames below. From the lower and upper ‘decks’ of this beautifully crafted timber structure, there will be extraordinary views of a London panorama that stretches from Big Ben to St Paul’s cathedral. On arrival ‘aboard’, a nautical flag will be raised to signal occupation, with the visitors invited to fill in a logbook on the ‘bridge’ of the boat, detailing what they have experienced during their stay, out of the window as much as within themselves. This is contemporary architecture at its most playful, beguiling and thought-provoking. Bookings for A Room for London – for no more than one night – will be available through the website http://www.living-architecture.co.uk from 8 September 2011. Structure: The means of holding up the roof is manifest as a playful ribbon fabricated from laminated timber. The roof and floor slabs sit within the laminated timber ribbon. The floor slab employs a ballast accommodated within sections of the floor void to resist wind uplift. Adjustable pads under the main members would evenly distribute the load and take up an anomalies in the slope of the existing QEH roof. The laminated members would have joints at the knuckles for ease of carriage and assembly. The floor and roof slabs would come as cassettes for lifting into position allowing speedy internal fit-out within the weatherproof shell.